Budget Barbie: Remote Control Spider that Walks on Walls and the Ceiling? Remote Control Spider that Walks on Walls and the Ceiling? Today's post may seem random and odd but there is a method to the madness! My husband, oldest daughter and son all despise spiders and do the 'spider dance' if they come within 10 feet of one. My husband hates them so much he regularly dreams of them when he is under stress at work. It's because of my husband I had to look up this toy. He mentioned tonight that he saw a remote control spider for sale in a store and it said it can crawl up walls and across ceilings. He didn't know. So of course tonight I had to look it up! While I found 3 remote control spiders, only one was able to walk on walls or ceilings. Apparently it has a fan inside of it to allow for the realistic upside down world of being a ceiling dweller. 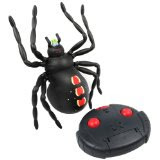 Although it's probably too big to look real, the Fantasma Web Runner Remote Control Spider is real enough to creep out almost anyone I think, if they saw a spider this big running across their ceiling! So, in honor of my husbands story about seeing this 'toy' in an electronics store tonight, I give my readers a spidery idea for Christmas, for about $40 according to Amazon.